SEOUL, South Korea -- As tens of thousands of North Koreans, including current leader Kim Jong Un, paid a visit on Sunday to Kim Jong Il's mausoleum in Pyongyang to commemorate the seventh anniversary of his death, North Korean state media also used the opportunity to take a jab at U.S. foreign policy. The criticism, published by Korean Central News Agency, Pyongyang's state-run media arm, did not call out President Donald Trump by name. Korean Central News Agency mostly took issue with the stalled nuclear negotiations. 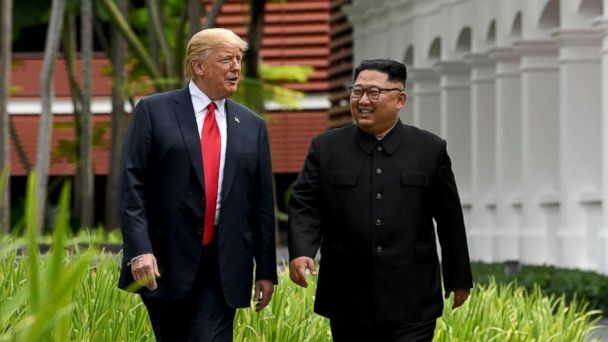 The commentary "made sure to control the level of criticism so as to not agitate the U.S.," hinting North Korea still would consider a second summit between Kim and Trump, according to Shin Beom-chul, director of the Center for Security and Unification at the Seoul-based Asan Institute for Policy Studies. "They want direct talks at the top level," Shin added. "They don't want to involve high-level officials." Park Hwee-rhak, a professer of politics at Kookmin University in Seoul, told ABC News that North Korea "is extremely afraid to pursue hardline provocations." "In that sense," Park added, "the current U.S. strategy seems to be working on containing North Korea." The commentary by KCNA was at least partially a response to the latest round of sanctions levied against North Korea by the U.S.
Last week, three officials, including Choe Ryong Hae, a close adviser to Kim who's seen as second-highest-ranking official in the regime, were condemned for alleged abuses of human rights. "The U.S. should realize before it is too late that 'maximum pressure' would not work against us and take a sincere approach to implementing the Singapore DPRK-U.S. Joint Statement," the KCNA report said. Kim Jong Il is believed to have died from a heart attack on Dec. 17, 2011. ABC News' Hakyung Kate Lee, Liz Sunwoo Kim and Soohyun Kim contributed to this report.